The estimated glomerular filtration rate (eGFR) is often used to model drug clearance (CL) and scale doses across age and body size. Over their lifetime, patients with cystic fibrosis (CF) receive repeated courses of tobramycin, an antibiotic with eGFR-dependent CL, for the treatment of pulmonary exacerbations. Tobramycin population pharmacokinetic (PK) modeling can be used to decipher the best approach to define eGFR for pediatric bridging studies. Inpatients with CF who received intravenous tobramycin between 1 January 2006 and 30 May 2018 were eligible for inclusion. Encounters without tobramycin concentration measurement or missing covariate data were excluded. Population PK analysis was performed using NONMEM.Covariate models were built following identification of the base model, with specific emphasis on the effect of different methods of estimating renal function as a covariate of tobramycin CL. A total of 296 CF patients contributed 1029 care encounters (420 pediatric, 609 adult) and 4352 tobramycin concentrations to this analysis. The median (minimum, maximum) age at encounter was 19 years (0.2, 60), with serum creatinine of 0.60 mg/dL (0.10, 3.41). A two-compartment model best described the observed data, with height and eGFR as significant covariates of tobramycin CL. eGFR was best modeled using a combination of the modified Schwartz and Chronic Kidney Disease Epidemiology Collaboration (CKDEPI) equations expressed in absolute units. The CKDEPI equation bridges PK data generated in adults to adolescents with CF better than the current regulatory standard. The eGFR should be expressed in absolute units (mL/min) for PK analyses. The online version of this article ( https://doi.org/10.1007/s40262-019-00761-5) contains supplementary material, which is available to authorized users. This work was supported in part by start-up funds from the University of Michigan College of Pharmacy to MPP. Ryan L. Crass and Manjunath P. Pai have no potential conflicts of interest that might be relevant to this work. US Food and Drug Administration, Center for Drug Evaluation and Research (CDER). General clinical pharmacology considerations for pediatric studies for drugs and biological products: guidance for industry; 2014. https://www.fda.gov/downloads/Drugs/GuidanceComplianceRegulatoryInformation/Guidances/UCM425885.pdf. Accessed Mar 2019. R Core Team (2017). R: a language and environment for statistical computing. R Foundation for Statistical Computing, Vienna. https://www.R-project.org/. US Food and Drug Administration, Center for Drug Evaluation and Research (CDER). 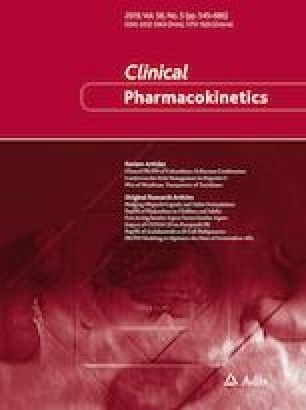 Guidance for industry: pharmacokinetics in patients with impaired renal function - study design, data analysis, and impact on dosing and labeling; 2010. https://www.fda.gov/downloads/drugs/guidances/ucm204959.pdf. Accessed 9 May 2018.